Colour coding helps reduce the risk of cross contamination, improves hygiene and reduces the risk of bacteria transfer between work areas. Mops, buckets, handles, brooms, brushes, cloths, wipes, etc. can all be colour coded for the work place. 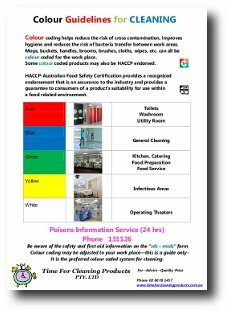 Some colour coded products may also be HACCP endorsed. HACCP-Australian Food Safety Certification provides a recognized endorsement that is an assurance to the industry and provides a guarantee to consumers of a product’s suitability for use within a food related environment. Also available as a laminated version here.